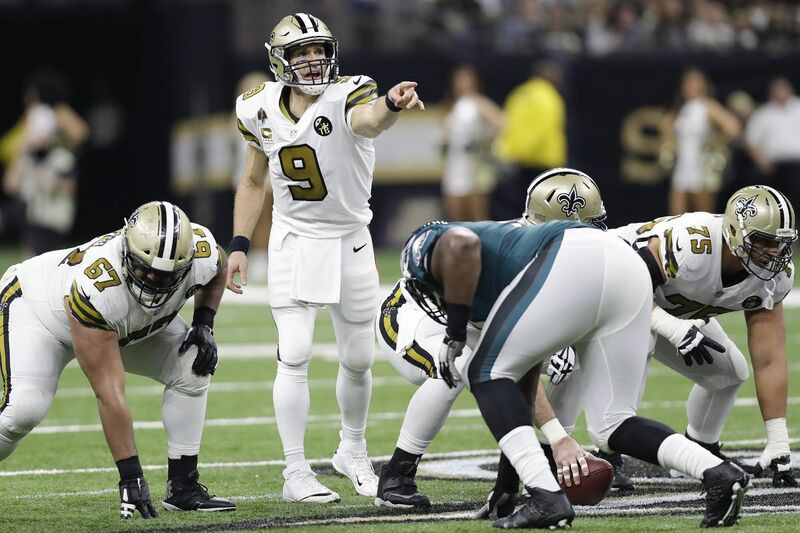 New Orleans Saints quarterback Drew Brees points to the Eagles defense on Sunday, November 18, 2018 in New Orleans. — Drew Brees has been sacked just 17 times in 506 pass plays this season. That’s one sack every 29.8 pass plays. It’s the fourth best sack rate of his career and the best since 2008, when he was sacked just 13 times in 648 pass plays (1/49.8). — Brees has the lowest sack percentage among active quarterbacks, and the fifth lowest sack percentage in league history. He’s been sacked once every 25.8 pass plays in his career. He’s been sacked 395 times in 263 career starts (1.5 per game). — Brees has been sacked more than two times in a game this season just once. That was in Week 3 when the Browns sacked him three times in a 21-18 Saints victory. — Brees averaged 2.43 seconds from snap to throw this season. That was the fifth fastest average in the league, according to Pro Football Focus, behind the Steelers’ Ben Roethlisberger (2.38), the Bengals’ Andy Dalton (2.39), the Raiders’ Derek Carr (2.41) and the Chargers’ Philip Rivers (2.42). He averaged 2.41 seconds from snap to throw against the Eagles in Week 11. Brees wasn’t sacked in that game and was pressured on just eight of his 30 dropbacks. — The Eagles had 44 sacks this season. That’s their most since 2014, when they had 49 with Bill Davis as their defensive coordinator. — According to Pro Football Focus, the Eagles had 362 total quarterback pressures (sacks, hits, hurries) this season. Interestingly, that’s 68 fewer pressures than last year, when they had 38 sacks. — Fletcher Cox’s goal heading into the season, besides winning another Super Bowl title, was to be the NFL’s Defensive Player of the Year. He came up short on that. The Rams’ Aaron Donald is expected to win the award. But Cox finished with a career-high 10 ½ sacks and had a career-high 95 total quarterback pressures, which was second only to Donald, who had 106. His 24 quarterback hits were the most in the NFL. — The Eagles had 74 quarterbacks pressures, including 10 sacks, in their last three games. Brandon Graham had 23 of those 74 pressures. Michael Bennett had 16, Cox 15 and Chris Long 10. — Nick Foles attempted five passes against the Bears that traveled 20 or more yards from the line of scrimmage. He completed two of them for 58 yards and one interception. A sixth deep ball, a 35-yard throw to Jordan Matthews, drew a pass interference penalty. The week before against the Redskins, Foles didn’t attempt any 20-plus yard passes. In fact, just six of his 33 attempts in that game, traveled farther than five yards beyond the line of scrimmage. — In his four starts since replacing injured Carson Wentz, Foles has been getting the ball out quickly. He has averaged 2.22 seconds from snap to throw. — In his last four starts, Foles has a 73.2 completion percentage and has averaged 8.0 yards per attempt. — Foles has a 4-1 career postseason record as a starter. He has a 105.2 career passer rating in the postseason, including 10 touchdown passes and three interceptions. — Foles has a 110.8 third-down passer rating in his last four starts, including an 80.9 completion percentage and a 9.2 yards-per-attempt average. Twenty-one of his 42 pass attempts (50.0) have produced first downs. — No one has benefited more from Foles replacing Carson Wentz than wide receiver Alshon Jeffery. In Foles’ four starts, Jeffery has been targeted 27 times. He has 22 catches and is averaging 17.4 yards per catch. Sixteen of those 22 receptions have been for first downs. — Foles has a 97.4 passer rating with 11 personnel (1 RB, 1 TE, 3 WR) in the last four games, and a 104.8 rating with 12 personnel (1 RB, 2 TE). — In the Eagles’ last three games, Foles has completed 12 of 18 passes in the red zone, with five TDs, no interceptions and one sack. — The Eagles averaged just 1.8 yards per carry against the Bears last week. Sixteen of their 23 rushing attempts gained two yards or less. — Rookie Josh Adams played just one snap and had one carry against the Bears. He had 86 carries in the previous six games. — The Eagles finished 30th in rush average this season, averaging just 3.9 yards per carry. In their last five games, they’ve averaged just 3.0 yards per carry. — They have had just nine runs of 10 yards or more in the last five games. They had 36 in their first 12 games. The Saints allowed just 30 runs of 10-plus yards, which was the second fewest in the league (Chicago gave up 28). — The Eagles finished first in red zone defense, holding opponents to a league-best 44.6 touchdown percentage inside the 20. But the 56 red-zone challenges they faced were the ninth most in the league. Just one of the eight teams with more red-zone challenges — the Chiefs (58) — managed to make the playoffs. — The Saints averaged 6.61 yards per play on first down this season. That was the third best first-down average in the league. The Eagles allowed 6.41 yards per play on first down. That was the tied with the Rams for the worst in the league. — Opponents have converted just 12 of 47 third-down opportunities against the Eagles defense in the last four games. Just eight of their opponents’ 35 third-down pass attempts in those four games produced first downs. — The Eagles finished 21st in opponent rush average (4.7), but have been much better lately. They’ve held their last three opponents to 3.0 yards per carry. They’ve allowed just seven rushing first downs and four runs of 10 yards or more in those three games. — In their Week 11 win over the Eagles, the Saints rushed for 173 yards on 37 carries. They had runs of 38, 17, 16 and 14 yards. — The Eagles have allowed just 16 points on their opponents’ first three possessions in the last five games. — The Eagles used 11 personnel (1 RB, 1 TE, 3 WR) on 41 of their 64 offensive plays against the Bears last week (64.1 percent). Twenty-nine of those 41 plays were pass plays. Twelve were runs.